Oriental rabbi; lived at Mosul toward the end of the twelfth century. He was a nephew of the exilarch Daniel b. Solomon (S. Jona writes "Daniel b. Samuel"; also called "Daniel ben Ḥasdai"), who died in 1175, leaving no male offspring. David contended for the position of exilarch with his cousin Samuel; but while they were thus contending, Samuel b. 'Ali ha-Levi anticipated both and obtained the office. Certain authors identify this David with David b. Hodaya, exilarch of Mosul, and think that Al-Ḥarizi mentions him ("Taḥkemoni," ch. 46). Pethahiah ("Sibbub," pp. 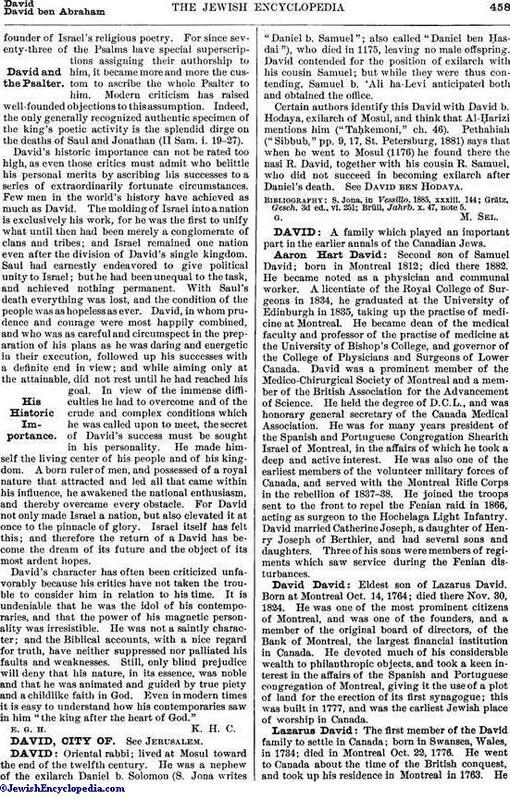 9, 17, St. Petersburg, 1881) says that when he went to Mosul (1176) he found there the nasi R. David, together with his cousin R. Samuel, who did not succeed in becoming exilarch after Daniel's death. See David ben Hodaya. Brüll, Jahrb. x. 47, note 5.